The record box office opening of 'The Hunger Games' lifted stocks tied to the post-apocalyptic film. 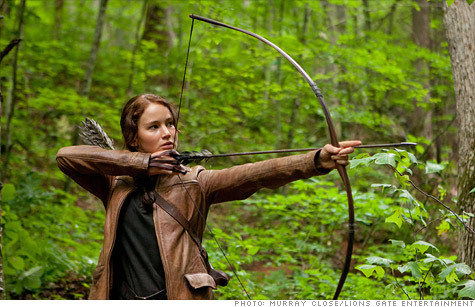 NEW YORK (CNNMoney) -- A record box office opening for "The Hunger Games" has investors buying shares of the movie's studio, the publisher of the books on which the film is based, and various theater chains. Lions Gate Entertainment (LGF), whose Lionsgate studio released the film in the United States and several overseas markets, jumped 3.9% in early Monday trading on news that the movie took in $155 million in U.S. ticket sales over the weekend. It was the best opening ever for a non-sequel, far surpassing forecasts of between $70 million and $90 million. "The Hunger Games" opening trailed only two Time Warner (TWX, Fortune 500) films. One is "Harry Potter and the Deathly Hallows, Part 2," which did $168 million in sales on its way to total worldwide sales of $1.3 billion. The other was "The Dark Knight," which took in $158.4 million in 2008 en route to $1 billion in total box office receipts. Time Warner is the parent of CNNMoney. Through Friday, shares of Lions Gate had risen nearly 75% so far this year in anticipation of "The Hunger Games" and on the company's purchase of Summit Entertainment, the independent studio that produces the "Twilight" movie series. Shares of Scholastic (SCHL), publisher of "The Hunger Games" books, gained 0.7% Monday, leaving it up 26% for the year to date. Earlier this month, the company said the buzz in advance of the movie opening has helped lift sales of the books. "The Hunger Games" was first published in hardback in September 2008. The second in the trilogy, "Catching Fire" came out the next year, with the final book in the series hitting bookstores in 2010. Between them, there are 24 million copies of the three books in print in the United States alone. Also advancing Monday were shares of theater operators, where crowds queued up this weekend for the post-apocalypse teen drama. Carmike Cinemas (CKEC) was the best performer of the theater chains in early trading, up 2.4%, followed by a 1.3% gain for Cinemark Holdings (CNK) and a 1% gain for large-screen theater operator IMAX (IMAX). The other major publicly traded chain, Regal Entertainment Group (RGC), rose 0.4%. Hopes for "The Hunger Games" and such widely anticipated titles as "The Avengers," "Dark Knight Rises" and the final "Twilight" movie have investors seeing a rebound for theater operators in 2012. They suffered a down year in 2011, and weathered some early missteps this year, including Walt Disney's (DIS, Fortune 500) now historic bomb "John Carter."